The following is a few pointers on driving the RapMan prototyper WelTec purchased in late 2009. All the documentation is online in PDF format, the build manuals are 3d PDFs meaning they're best viewed with adobe reader. All manuals are on the Bits From Bytes download page. The version 3.0 manuals apply to our machine. The build manuals should only be needed if something breaks. Information on machine setup such as setting the Z axis height is all in the operations manual. Skeinforge: The application that slices STL files into layers and generates the gCode tool paths. The Skeinforge Wiki has information on how to install and configure skeinforge. Start by generating an STL file from your 3d CAD package of choice. Open Skeinforge and select the material profile you want to use. 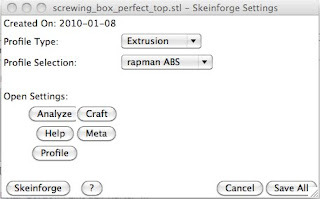 Click the Skeinforge button to open the file you wish to process. Skeinforge will appear to "lock up" until is has finished generating the tool paths. Once Skeinforge has finished there will be a YourFileName.bfb file in the directory the STL file was opened from. Copy the .bfb file into the root directory of a FAT32 formatted SD card. Insert SD card into the machine and refer to operation manual on how to run the file.